Earlier this week the Accidental Locavore got some beautiful loin lamb chops. Since there was still a little of the yogurt I made last week in the fridge, I thought I’d marinate the chops in the yogurt. Yogurt tenderizes meat, something Indians have known for a long time. 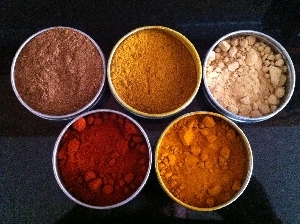 Here’s what I used, it will look like a lot of spices, but I had them on hand. Use what you’ve got, and what you like. This made more than enough marinade for 5 loin lamb chops. You can also use it for a butterflied leg of lamb. Mix everything together, taste and adjust the seasonings. Pour over lamb chops in either a covered dish or a zip-lock bag. Make sure lamb is well coated. Refrigerate for at least 4 hours. About 1/2 hour before cooking, remove from the refrigerator, and let come to room temperature. Heat a grill, grill pan, or broiler. Remove the lamb from the marinade and shake off any excess marinade. Grill the lamb chops until medium rare, about 6 minutes a side. I like to halve a lime and grill it with the lamb, cut side down. It’s great squeezed over the meat. You can tell if the meat is done by poking them with your finger. It should be a little firm to the touch. Take your second finger of your right hand and touch the thumb of the same hand. With your second finger of the left hand, poke the fleshy part below the thumb/second finger of the right hand. That’s how your meat should feel for medium rare.